DC glow discharge (GD) at atmospheric pressure is an interesting discharge type first mentioned by Gambing and Edels in 1954 . The DC GD is a stable continuous discharge regime with no pulses. It operates with DC currents from 1.6 to 150 mA or more, and DC voltages from a few kilovolts to a few hundred volts. The inter-electrode distance can be varied from 1 mm to a few cm, depending on the gas flow conditions and the current. The voltage-current characteristic of the discharge in ambient air has a negative slope (Fig. 1). In contrast, the discharge power increases with the current. 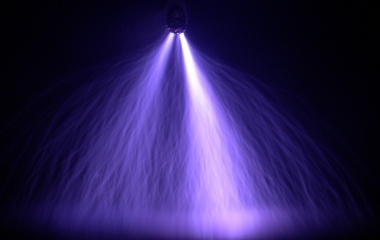 At low currents, the discharge has a narrow channel of ~0.5 mm diameter, at higher currents it becomes wider and diffuse (Fig. 2). It was investigated both in ambient and preheated air. In preheated air, the discharge diameter is wider. This effect is due to the presence of larger dissipative thermal gradients in the ambient air discharge than in the preheated air plume. Fig. 1. Voltage-current characteristic of the DC discharge in ambient air. Gap distance d = 7 mm Fig. 2. DC glow discharge in air at room temperature and atmospheric pressure. The discharge is ignited by a streamer-to-spark transition, but the ballast resistor of ~100-1000 kΩ immediately limits the spark current. However, the ballast resistor is chosen so that the limiting current is large enough that the discharge, after extinction of the initial spark phase, enters a state of permanent conduction. The ballast-limited current then controls this pulse-less discharge regime. 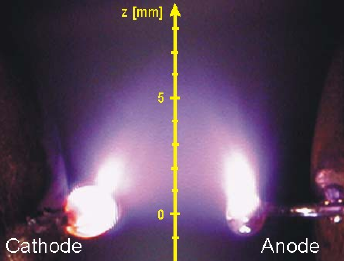 Volume scaling of the GD plasma while keeping low gas temperature (<2000 K) and high electron density (>1012 cm-3) is important for various applications, such as electromagnetic wave shielding, or so called ‘plasma ramparts’. 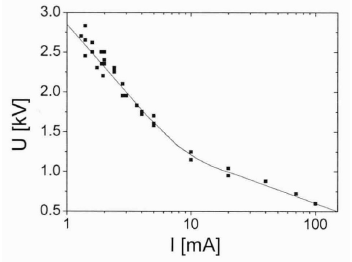 Our approach to volume scaling of GD was putting two or more discharges side by side (Fig. 3). A plasma sheath can be obtained when they become close enough to each other. The electrode material is not crucial for the discharge mechanism: Rh, Cu, Pt, stainless steel and other materials were tested; even water can be one of electrodes. At least one electrode with a small radius of curvature (pin) permits easier discharge ignition. Various materials perform different cathode falls; the cathode fall is important for the mechanism of secondary electron emission from the cathode, typical for glow discharges. With low discharge currents that do not heat the cathode too much, the cathode fall values agree very well with typical low pressure glow discharge values. If the current is increased to hundreds mA, substantially more gas heating occurs, the discharge gas temperature exceeds 2000 K and the cathode gets heated. As a result, the thermionic effect starts to compete with the typical cathode fall mechanism, and the cathode fall gets progressively lowered. 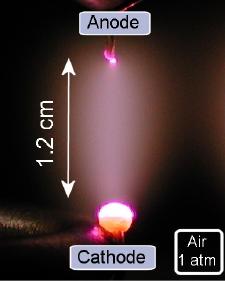 The use of thermionic cathodes was further investigated in order to enhance the electron density in the discharge plasma. Various thermionic materials were tested as cathodes, such as Mo, LaCrO3 or LaB6. 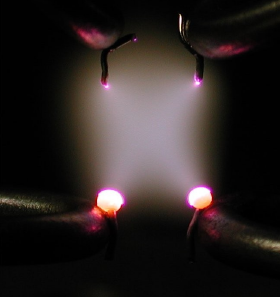 To extend the size of this plasma with high electron densities, we used glass or quartz tubes and swirl gas flow. This enables extending the discharge length up to 10 cm (Fig. 4). Fig. 3. 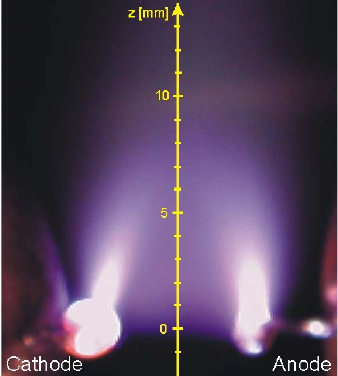 Dual discharge in ambient air at atmospheric pressure, separation 0.9 cm between discharges. The interelectrode distance 1.2 cm, gas velocity 0.5 m/s, current 100 mA and voltage 1.4 kV per single discharge. Fig. 4. DC air discharge with a LaCrO3 cathode in a 6.5 cm long glass tube and vortex flow, Q = 110 slpm, tube diameter 8.38 mm, I = 500 mA, discharge diameter 1.8 mm. 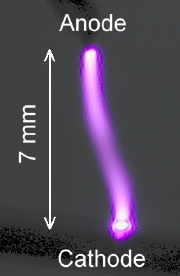 An interesting phenomenon was observed in a DC glow discharge in transverse preheated air flow. The slower flow 'blows out' the discharge farther than the faster flow (Fig. 5). We measured the electric field strength E and gas temperature, thus the gas density N to obtain the distribution of the reduced field E/N. These measurements revealed that the observed counter-intuitive result is mainly caused by the gas heating in the discharge: the temperature is higher for the slower flow, thus enhancing the reduced electric field E/N and causing the discharge to extend farther downstream. Fig. 5. Transverse DC glow discharges in a vertical upward atmospheric air flow preheated to ~2000 K. Gap spacing 5 mm, current 100 mA. Machala Z.: Continuous and transient electrical discharges, streamer triggered, at atmospheric pressure, for the removal of Volatile Organic Compounds (VOC), Ph.D. thesis, University Paris-Sud XI, France, Comenius University Bratislava, Slovakia, (2000).